POLY BUBBLE MAILER SIZE - 10.5x16 Inch black padded envelop (usable size-10.5x15 Inch). Pack of 25pcs. COST-EFFECTIVE BUBBLE MAILERS - The padded envelopes are lightweight and water-resistant. Lower the shipping cost of your business and protect your products on the rainy or snowy day. 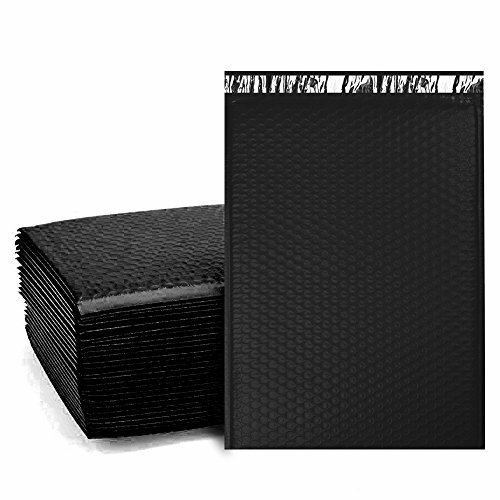 CUSHION MAILERS - The padding is sufficient to mail small and the items that needed protection. Keep your products safety and make your customer no complaint. TIGHT SEAL - The self-seal closure provides a reliable, tamper-evident tight seal to secure all enclosures. Extra smooth surface is perfect for handwriting, labeling and stamping.